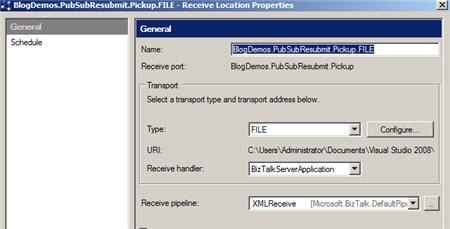 Why Is This Still a Routing Failure in BizTalk Server 2009? With BizTalk 2013 and later, registry changes are no more required. It can be configured through the Host general settings. 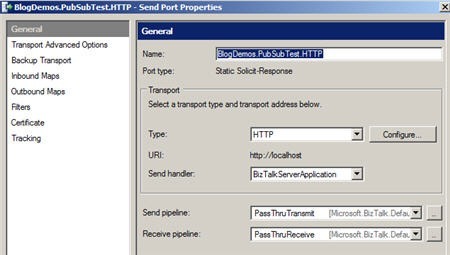 A couple weeks ago, Yossi Dahan followed up on a post of his where he noticed that when a message absorbed by a one-way receive port was published to the BizTalk MessageBox where more than one request-response port was waiting for it, an error occurred. Yossi noted that this appeared to be fixed in BizTalk 2006 through a hotfix available and that this fix is incorporated in BizTalk Server 2009. However, I just made the error occur in BizTalk 2009. To test this, I started with a one way receive port (yes, I stole the one from yesterday’s blog post … sue me). Next, I created two HTTP solicit-response (two way) send ports with garbage addresses. The address didn’t matter since the port never gets called anyway.